The first step in any move abroad is finding an international moving company in Seattle and then decide exactly what you want to take, deciding what the best options are and much more. You could be moving back from abroad and want your personal effects shipped from overseas. The good news is that Schumacher’s international moving service has been helping people relocate to and from Seattle for twenty years. Whether it’s a commercial move, residential or someone just wants to ship a few boxes, we’ll make relocating internationally smooth and enjoyable. Because of Seattle’s port, it is possible that your goods would be sailing from here. That means, we would arrange either to have your goods packed and wrapped, then transported for loading. 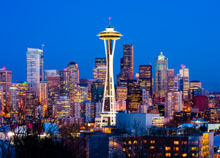 For those moving overseas from a nearby city or suburb like Kirkland, Bellevue or Renton, you’ll also be able to use our door to door service. 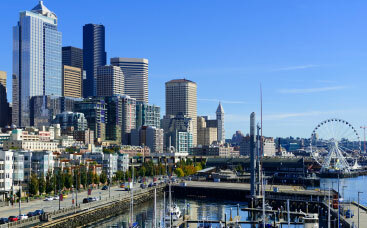 Most full container loads can be shipped locally, but more than likely, you’ll want to use our consolidated service when shipping household goods overseas from Seattle. Pick Up and wrapping will be the same but you’ll be sharing a container with others. To learn more about our consolidation service, call one of our experts at 1-800-599-0190. How Long Will it Take to Ship My Goods from Seattle? There are containers leaving each week to countries across the globe but some are more frequent than others. This in itself can influence expected arrival times. However, with our ocean contracts with the steam lines and own crews, we do our best to make sure every shipment reaches its final destination within the quoted time period. In general, if you are moving to Australia from Seattle you can expect your cargo to be on the water for roughly three weeks. Household goods headed to Germany or the UK can take up to four weeks when leaving from our warehouse in Los Angeles. Don’t hesitate to speak with one of our moving specialists if you have further questions about moving your home overseas from Seattle or get a free quote using our form.